Monique Griffith Designs: Race for a Cure! I love all your projects and using the stamps was a grand idea!!! What a great project! Beautiful job! And a wonderful prize too. Keeping my fingers crossed. Looks like everyone has been having trouble with Blogger, not just me, eh? Great layout! Thank you for sharing it!!! Great layout Emma! I love the font you used with your stamps. i also love the 8x8 size and have done a few baby books that way. also thanks for the chance to win those lovely prizes. Love it love it love it. Great job and thanks for doing this. I know its a special cause for you and love how the crafting world comes together to support. I am a new follower!! Great layout!! That's a wonderful layout! I love it! Great Job Emma! Awesome Prize package! What a great cause! 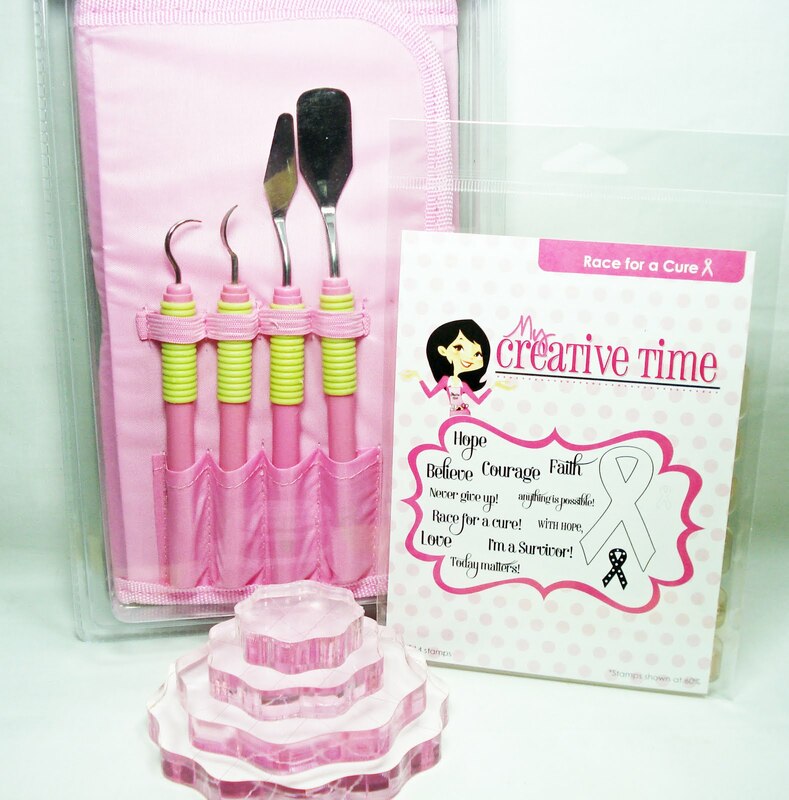 And the pink tool set is adorable! Pink tools! Love them. What an inspiring layout and beautiful stamp set as well. Love your wonderful project. This is a subject dear to my heart. I lost a sister to this horrible disease. Thanks for sharing. Nice Project. Those ribbons all lined up should be a border punch... very cool. Love your lo Emma! The border of ribbons are just perfect and of course I love your stamp set!! Thanks for helping to "stamp" out breast cancer!!! Love this layout. And I have that stamp set on my wish list. And love the all pink giveaway. Great layout Emma! I love the ribbon borders. Love this, Emma! Great card!!! It's so beautiful!!! Thanks for sharing your creativity!!! Love the layout. Your stamps are great. I didn't realize any cartride but the pink journey had ribbons, so that is nice to know! Such a great LO Emma! I love it! Beatiful layout! Thanks for sharing!! Super great layout! I love the cause! This 8x8 page is lovely. The stamps are great. Thanks for sharing your talent. Thanks again for the chance to win this awesome prize! 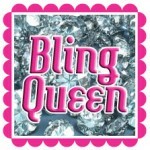 Your layout is fabulous! Fantastic layout and a fantastic giveaway!. Thanks for the chance. WOW!!! What a fabulous page! This scrapbook layout is stunning!!! The stamps look great on it! Your layout is great! I love how your stamps work so perfectly with it. Thanks for sharing your project and thanks for the wonderful giveaway. very cute LO! Thanks so much for sharing!! I was so glad to see I had all the carts used for this beautiful card. It is really and inspiration. Thanks for the opportunity to win such wonderful gifts. I love doing 8x8 LO's too! 12 x 12 are intimidating and take me a whole day! I started doing 8x8's when I started my newborn's month-by-month scrapbook for him. Almost instant gratification! Thanks for sharing all of your wonderful creations and giving us a chance to win some wonderful items. Great project! This was a fabulous hop! This was an amazing hop and I enjoyed seeing all the projects. Thanks for the chance to win Emma's stamps. I love the quality of her stamps. Very cute.....always looking for new projects to inspire our friends fighting breast cancer. Sadly, more and more friends are needing encouragment. awesome! thank you so much for doing this. Great prizes too. All the projects were great and so is this set of stamps. Way to go "Miss" Emma. What an awesome layout. I love the paper choice and the sentiments are really awesome. I love this stamp set, the layout, and the cause you are supporting! :) Thanks for the fun hop and chance to win. So far Friday the 13th has been pretty lucky! What a wonderful surprise to see you over here Emma, your layout is awesome!!! Your stamps are perfect!!! You know I'd love to win this awesome prize pack! We Love You Emma!! Awesome blog hop. Your stamps are amazing and so is your talent! Thanks for all you do!! Sorry forgot to leave my email on the other comment! Love this layout its so great. What a beautiful layout, love those flowers, your sentiments fit perfectly on them. Very awesome and generous giveaway. Great Project thanks for sharing and for the chance to win. Beautiful layout, Emma! I just love your stamps, and you highlight them so well here! What a great job Emma did...I just love everything she creates.... she ROCKS!! What a great layout! My mom has recently finished her chemo treatments for breast cancer so this is a cause that is close to my heart. Thanks for sharing your fabulous page with us! I love your LO and the theme is so meaningful! I had BreastCancer over 5 yrs now! Yay and thank the Lord I've been cancer free. Ladies need to be aware that just because it doesn't run in your family definatley doesn't mean you can't get it. Because I did. I was shocked when diagnosed, first words out my mouth was no One in my Mom or Dad side has ever had BC. So be sure to self check each month and get monograms as you should. That's how they found mine, a routine test! Your layout is very nice Emma! I am in love with all your stamps! Keep on creating! Love the layout. This stamp set is simply wonderful. Great Layout!! Your stamp sets are just perfect - you obviously put a lot of time into your designs! Great giveaway - kudos for you to hosting a Breast Cancer Fight in May!! October isn't enough any more!!! Loved the layout!! And the stamps were amazing!! TFS!! Take Care!! wow, Love your projects! TFS. FABULOUS layout - wonderful cause, and incredible set of stamps!!! Beautiful job Emma! Love the layout. Thank you for sharing the design layout on the "gyspy girl" . Thank you also to everyone for a great cause! Thank you for posting this wonderful layout. I walked last week in the "Race for a Cure" and this would make a perfect page for me. Nice to meet you. Now I'm off to your blog. I love the layout! It is really awesome. I also love the pink tools. Thanks for the chance to win a great giveaway! What a beautiful and inspiring layout. Love the colors, design and the stamps used on the page! Adorable Layout!! That is the cutest!! The stamps are perfect!! As a survivoe I want to thank you for supporting the 'cause!!! I envy your talent with your gypsy girl. I have the G for sometime now. but still intimidated. I have trouble learning to create a blog (not tech savvy). First Congrat on the Guest DT! So funny to type that! LOL. Secondly not only was your tag INCREDIBLE but this layout is just AMAZING! Every single details is just spot on! I love how you incorporated your stamps with it! The papers, the colors and how you used so many cartridges! Great job...as always. What an honor to do this for not only Monique but soo / too many women and even men! I LOVE how you are donating some of the proceeds too! As always so inpiring and just LUV ya! I love your work Emma! Great use of stamps! Love it! Just so cute! What a Wonderful Cause! Super sweet layout and really nice giveaway! I'm headed to your blog hop next!!!! Love this page. If I don't win the stamp set, I'll be buying it. Very cool--I love it. What an inspiration and message of hope. Monique, you are brilliant! The merri-go-round is perfect. Thank you for sharing your card,go pink! Love this project! Hate ALL cancers! Love the stamps & the tool set. Thanks for the chance to win! Fabulous layout - just love it!!! 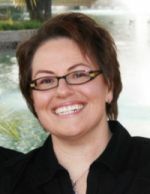 Lost a friend to breast cancer and know many others, including our wonderful Monique! Love the stamps and blocks and pink tool kit! Thanks for the great giveaway - would love to win! Wonderful layout!!!! Love all the detail. Thanks for the chance to win. LOve this project and the sentiments. Love you project....what a wonderful cause. Thanks for such a great giveaway. Great project & a great cause. I am headed to my Joanne's to find that paper stack! I love the lo, Emma! Your stamp set is great...I like how you used it in your lo...TFS! I forgot those banners were on the S&S cart...I forget all of the designs on the carts I've got. Great layout-terrific stamps. Great layout for a great cause. I just love your blog!!! Your layout is so beautiful!! I love this project. I am an oncology nurse practitioner and love my patients dearly. I need the stamps to do projects and bulletin boards at work. Love your project! You are very creative! Those stamps are awesome! Such a wonderful project Emma! Great use of your wonderful new stamps. What a great layout, I love it. I love everything that Emma makes. Nice job on the layout Emma would really love to win this stamp set. What a wonderful cause and a great layout! Would love to win this prize especially the stamp set. My stepdaughter is a scrapper and she was diagnosed with breast cancer. This would make a great addition to our stash. TFS! What a great project! Thank you for using the Gypsy. I've had mine for almost a year, but I'm really starting to get the hang of it and love seeing what I'm cutting out! Your project is beautiful! Whooo hooo Emma! Geat layout. I can't seem to get the hang of the smaller layouts. It's either 12x12 or cards for me. Love your layout = it's beautiful! What a great blog hop and stamp set - supporting a great cause!! Emma, I love the layout!!! Adorable!!! Thanks so much for sharing!! Awesome page...I'm the opposite from you...love 12x12, but I do 8x8 as gifts. 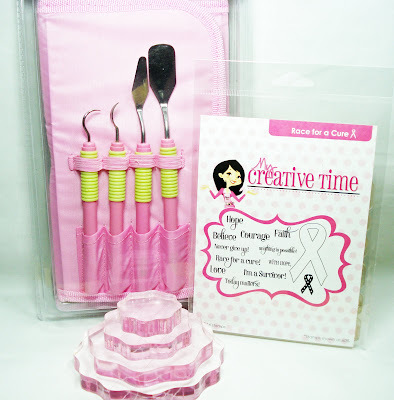 I would love to win the pink tool kit..
LOVE LOVE LOVE your LO. It is awesome! Blogger has been giving everyone a run for the money the last few days!! GREAT giveaway I so love your stamps I am waiting till I can budget to buy and that is on top of my wishlist! Love your project, you are so very creative! Thanks for sharing your talents. just loving your project, the hop, the blogs and the cause. you are and everyone is stunning. Love your design! I love anything that supports finding the cure! Wow. What a nice project! I need this set.. cross fingers.. The patterned paper looks very pretty! Loved how you were able to incorporate so many images into one priject!! This is very nice, Emma! I love the way you used the border feature on the ribbons and how you used so many of the stamps! Just love your project. It is awesome. Thanks for the giveaway. I love this layout for many reasons, but most of all because I have three friends that have survived breast cancer! I must have that stamp set - such a great cause! THANKS!!! Emma, your layout is just GORGEOUS. Love it. Thank you again for doing this hop along with your DT. Love the project!!! The stamp set is just wonderful!!! Love, love, love it! TFS!!! I love your blog. Great projects and givawyas. Great layout! I love your stamps too. Such a wonderful cause. TFS. This is a great project, I love it. Love this layout, such a creative way to use those carts! Thank you for your stamp set and promoting this amazing cause! Awesome work!! This has been a great hop. What a beautiful page!! And thanks for the generous donations you are making. My husband has Non-Hodgkins Lymphoma, so a cure for cancer is something that's VERY close to our hearts. Thanks also for the chance at an awesome giveaway! Lovely work as well as the greatest cause ever! TFS! Love your layout Emma and your stamp set! I have so many of your sets and they are all so awesome! Hope I win this one, if not I will definitely have to buy it!! Wonderful layout as always! Love the stamp set! I really love your layout. I love how you put the bling on the ribbons! Great LO!!! I Love how you welded the pink ribbons together!And the sentiments WOW!! !Believe,Faith,Love,Hope & Never give up,Today matters,WITH HOPE,anything is possible!! !WOW You Are So Right!!! AWESOME JOB LOVE THE RACE FOR A CURE STAMPS SET! "AWESOME LAYOUT"
I love that page it is so special and pretty. I would love to win this prize. love this project. It is just so neat. Thank you for the chance to win this blog candy. OMG! I love this layout! The use of your stamp was a brillant idea. They look awesome on the layout. Love the "pink" project, especially the ribbon of ribbons! Thank you for sharing. 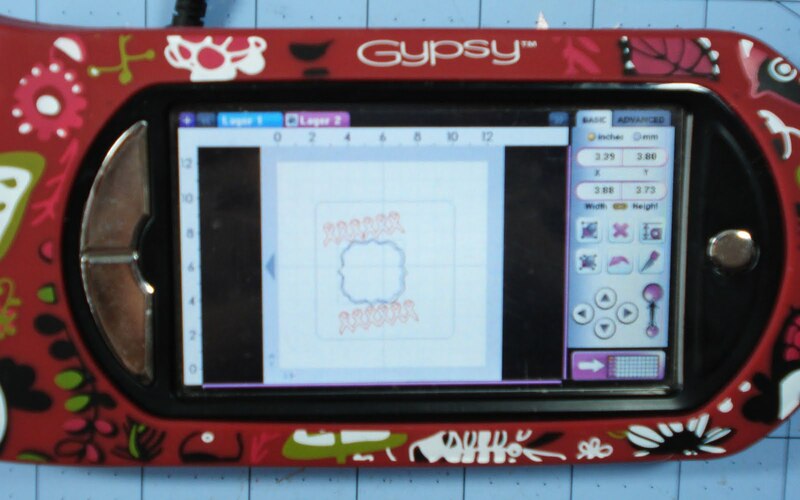 I love your layout and love that you showed the steps on the Gypsy! I couldn't crop without my Cricut and Gypsy. TFS this great project and for the giveawy! Beautiful. Thanks for sharing how you made it. I might have to make something similar for mom who is an almost 3 year survivor. Awesome!! I love your stamp set as well. Next thing on my purchase list!